In the previous backyard post I gave you a highlight of the general areas of clean up and told you how we filled a dumpster to the brim with junk that we pulled out of the backyard. In this post I wanted to give some details of exactly what we were dealing with. Here's an aerial shot of the farmhouse and yard from the county website. As you can see, there is a lot of stuff, so needless to say, we knew there was some serous cleanup that needed to happen. As we got to work, we couldn't believe our eyes, at almost every turn, we came across something that had obviously been in its current place for years, and possibly decades in some instances. Here's a small sampling of what I'm talking about. This beautiful Silver Maple Tree had, at one point, a limb partially break of. The previous owners, in a moment of MacGyver-ness, decided to build a brace for the tree limb. 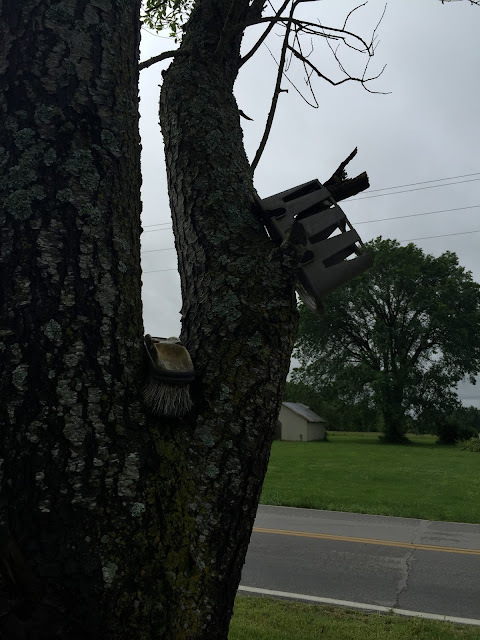 We initially thought that this was a old fence piece, propped against the tree, but as we investigated it, we realized what had happened and what they were attempting to do. Surprisingly, the limb survived, but this brace has been absorbed by the tree. As shown in the second picture. Below is a wire metal bin that was on casters that had been setting there for probably close to a decade. The bottom of the bin was about 6 inches under ground and has partially grown into the tree, as shown in the second picture. We were able to dig out 3 sides and all four casters. The remaining wire pieces we cut as close to the tree as possible. Eventually, the tree will grow around the edges sticking out. The poor trees on this property. This tree is right next to the wire bin tree and this metal post has been there for a VERY long time. There is no way we would be able to get this post out without killing the tree. Eventually this post will disappear inside this tree as well. The previous owners had a serious crush on pipes and posts. I'm not even exaggerating when I say we pulled out about 20 pipes that were just laying on the ground and were eventually overcome by nature. We would be raking leaves and hear the metal tines of the rake scrape across something, or cutting out a bush and our chainsaw would start throwing sparks as it came into contact with a metal post, or even just walking along in the 2-foot tall grass and trip over a pole that was laying in the middle of the yard. One might wonder why the grass was two feet tall; but we couldn't safely bring in a mower with all the stuff laying around in wait to cause harm. We would just weed-eat the areas we needed to be working in as we went along until we eventually got everything we could find by the end of last summer. The previous owners did NOT have a healthy respect for the dangers of electricity. This is just a small example of the self-wiring situation that was happening on this property. And the things we found tossed up in the trees. So many things in trees. A scrub brush and I'm not sure what the other item is up in a tree in the front yard. And the shed. This building will get a post of it's own one day soon. But here's and idea of what were dealing with. A tree limb was trimmed and then just left laying where it fell. For years. Now that you've gotten a glimpse into some of what we've been dealing with, I'll take you further into the process with a broader overview in the next post.